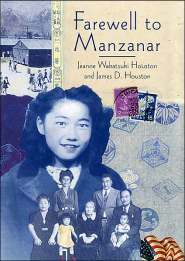 I just finished rereading Farewell to Manzanar, Jeanne Wakatsuki Houston's memoir of the years she spent from ages seven to eleven at an internment camp for Japanese-Americans during World War II. In this passage, on page 109, Jeanne describes her fascination with baton twirling, a skill she learned at the camp, and wonders what drew her to the activity. "'I wonder, because of all the activities I tried out in camp, this was the one I stayed with, in fact returned to almost obsessively when I entered high school in Southern California a few years later. By that time I was desperate to be 'accepted,' and baton twirling was one trick I could perform that was thoroughly, unmistakably American — putting on the boots and a dress crisscrossed with braid, spinning the silver stick and tossing it high to the tune of a John Philip Sousa march."